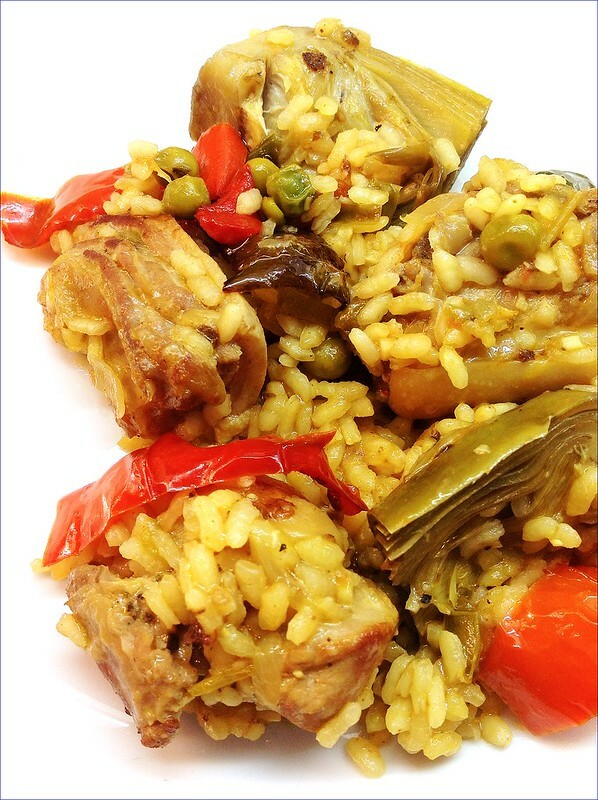 “Almost Murcia vegetable rice” with the addition of pig that I really liked. The meat, if you prefer, you can put it at the end “churruscadita” because we have used frying oil. In any case I am sure you would like to try. Sure. Adobamos the pork with salt, pepper, turmeric, oregano, a few drops of vinegar or wine. Stir and let sit for a day before cooking. We clean the artichokes, cut into quarters and boil 10 minutes with tough leaves. We add a little oil and a bar of broth or homemade stock. Strain the broth and reserve. We took the quarter artichokes and let drain. Heat up a pan with a little oil and brown them piglet. It has to be toasted, roasted enough … Reserved. In a large pot put oil and fry the red pepper and green. Aside and follow the same oil fry the garlic, onion and other very chopped pepper. When oil comes out add the rice, peas, artichokes, suckling pig and wine. Stir a couple of minutes and, then, the strained broth. Season and let cook until rice is tender to your liking. We let it sit a few minutes and serve accompanying the rest of the peppers we booked at first. If you like mussels certainly not going to try to resist this appetizer. This spicy and delicious sauce is going just perfect to enjoy. Chop the onion and poached in a pan with oil. Add the chopped pepper and a little salt. When they start to be tender incorporate peeled and chopped tomatoes with chilli. Fry on medium-low heat about 20 minutes, grind in a blender and reserve. In a pan with the wine, put the mussels thoroughly cleaned. We cover until they open. The retired. Strain the broth and reserve. Cut the garlic into slices and brown them in a pan with olive oil. Add the tablespoon of flour and stir. Pour the broth from the mussels and tomato sauce. We continue moving until it forms a sauce linked. 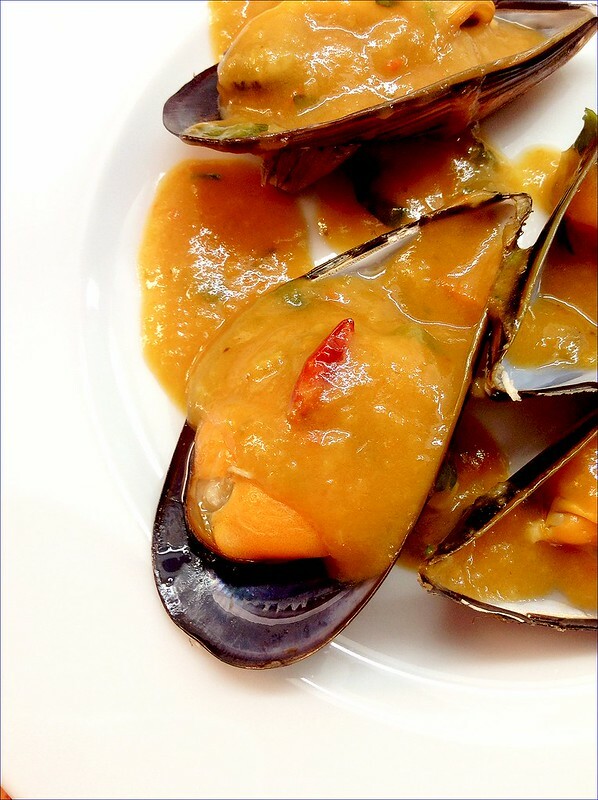 Mix the mussels with the sauce and cook 3 to 4 minutes. Sprinkle with chopped parsley. A few days ago Adobe chicken breasts to make some kebabs with peppers and onions. Enough left over so I remembered that in Seville is very typical that make rice marinated meat that gives it a special flavor. Marinade time depends on the intensity of flavor that we want to obtain. I did not put too much of spices but I left it in the refrigerator 24 hours. First grind the spices in a mortar or in a food processor. Cut the chicken into cubes and mix with the marinade and a little olive oil. Salamos and let stand at least 3 hours. In a pan with olive oil, fry the pepper cut into strips and set aside. In the same oil, first fry chopped garlic cloves and then incorporate the diced onion. Once browned add the chicken pieces. After 3 or 4 minutes, pour the rice, keep stirring, put the wine, wait for a bit and cover evaporate water (twice the rice) and almost tender when we put the pieces of pepper. Things change because they have to change, such changes or life time, by chance or fate for his kin. Anyway, I’m offering a recipe for those that would be impossible for me. I hated the cheese and any kind. One day, someone very dear, I had the opportunity to taste varieties of cheeses with due accompaniment. Mixtures unthinkable but it made me rethink that the cheeses were always the same: strong, smooth, soft and hard. Nuts, in moderation, transform any dish. This time I felt like hazelnut “novieta” the roquefort. Porto added sweet touch without masking flavors. But I think it is best probeis right? 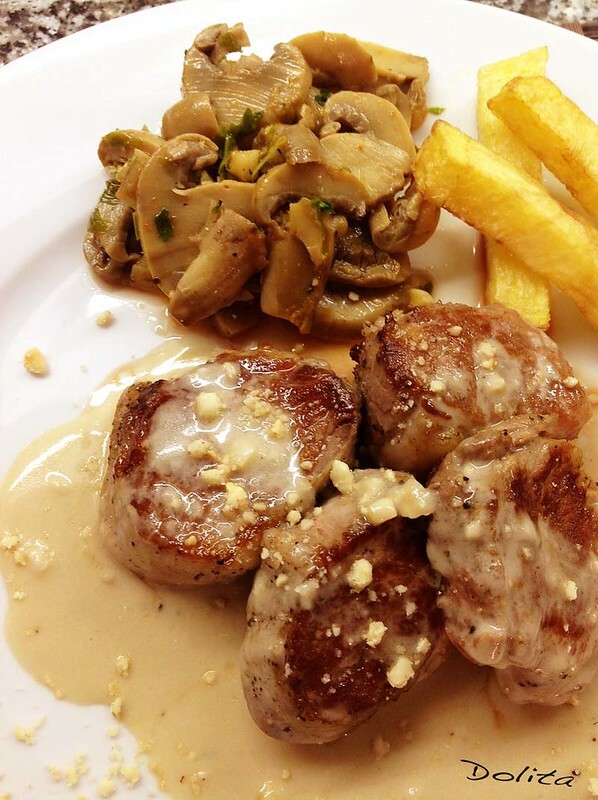 Cut the tenderloins into thick medallions and salpimentamos. majamos In a mortar hazelnuts. Melt the butter with the oil and add the diced cheese stirring constantly until dissolved. Then add the cream, wine and continue beating until creamy smooth, homogeneous consistency. We hazelnut reserving a little for the end of the plate. In a pan with a little olive oil sealed, high temperature, tenderloin medallions until golden and incorporated into the sauce. Sprinkle with the rest of hazelnut and accompany with mushrooms in sherry and chips. This recipe of Mexican origin is for lovers of vegetables and soups. The broth is very tasty. I added a little turmeric and cumin seeds. This is optional. As it stands great. You can use the leaves but I preferred blanched and freeze for another time. They were large and are ideal to fill them or just rebozarlas. We remove the chard stalks and guardarmos for another preparation. Well cleaned leaves and blanch in water with a little salt for a couple of minutes. Drain them in a colander and reserve the broth. We wash the tomatoes and blanch in hot water for a few seconds to peel them easily. We booked two and the rest is grind in the blender. Peel and finely chop the onion. 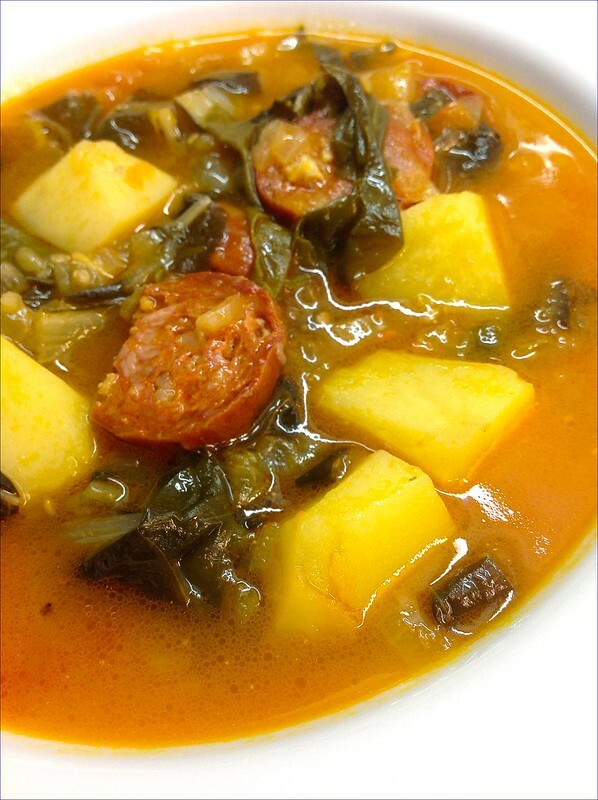 Peel and chop the potatoes into large chunks and sliced ​​chorizo. Heat the oil in a pan and fry the slices of sausage.The reserve. In the same oil, sauté the onions begin until tender. Add the potatoes and sauté on medium-low temperature 3 to 4 minutes. Add the tomato to grind. We 3 or 4 minutes and cover with Swiss chard broth (or vegetable). Boil 5 minutes. Peel the garlic and majamos in a mortar along with the chilli. What desleímos with some of the broth of the stew and add mixing well. Cut the chard leaves and add. Chop the tomatoes we booked and also incorporated. Season and cook 4 minutes more until the potato is tender and the broth linked. We ended up adding the slices of sausage. 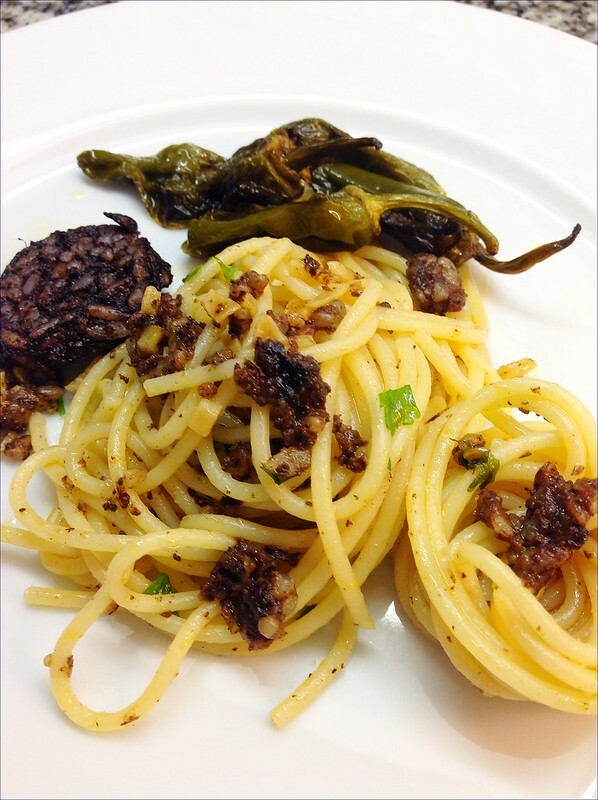 I can only say that although the pasta dishes not excite me, if I add any ingredients such as garlic, some pimientitos the Register, morcilla (Burgos, which I love) I can even say that NOT THE SAME. A tasty pasta dish that has some calories but more, we balance with a salad of lettuce tomato or simple. Worth it. In a pan with oil to fry the sliced ​​sausage slices. Do the same with the peppers. In the same pan start sautéing finely chopped garlic. When it starts to brown and then add the tomato chilli and 5 or 6 slices of sausage. Mix to make a paste and add the wine. Continue cooking until it forms a smooth paste. Prepare spaghetti as they are to our liking we add them to the pan trying not drain much so they are not dry. The incorporated to the pan and stir well, add the rest of the sliced ​​sausage and peppers. Sprinkle with chopped parsley. 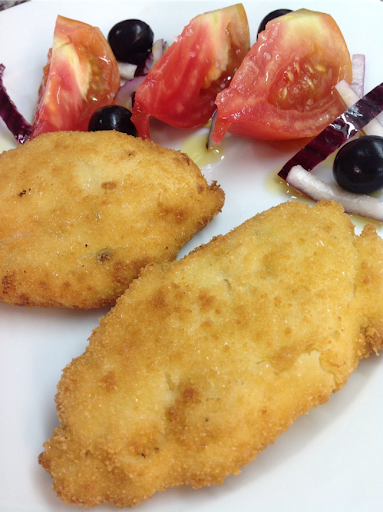 You can not miss these breasts with pepper bechamel. I like them grilled, are much tastier if the boil. It is important not to let the bechamel too cool to cover the chicken well. Fry in plenty of oil to brown well on all sides and above all, do not do a lot at one time or temperature would drop and would open. That’s the secret. If you bechamel spare, you can take advantage of adding tuna and make a small kibble for a snack. Salpimentamos breast fillets and brown them quickly, without making them too, in a pan with a little olive oil. Reserved. In a nonstick saucepan heat the butter. Incorporate finely chopped onion, poached a few minutes and add the peppers cut into thin strips. We put a little salt and continue sautéing until everything is tender. Then threw the flour and stir well. We will be adding hot milk gradually, helping to rods. Will remove continuously until we obtain a bechamel smooth and firm. Put the pepper, nutmeg and salt it to our liking. Let stand until cool slightly. Once we cool well beaten egg and breadcrumbs. Then we introduce one by one the fillets and place them in a bowl until completely cool. Prepare a pan with plenty of olive oil and let fry in batches (two at best) until they turn golden brown. The we placing on paper towels to absorb the oil. All served with a salad of tomato, red onion and black olives. 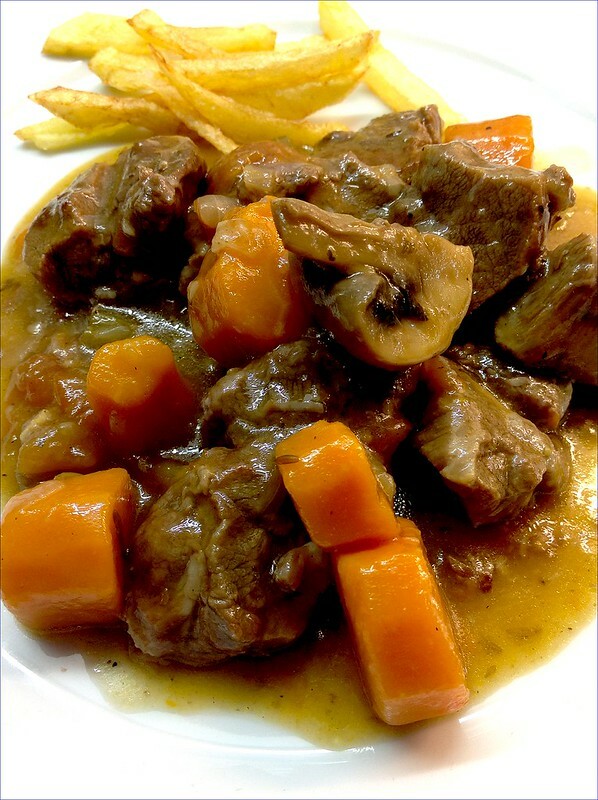 A tender braised cheek, tender and juicy. Spices play an important role and the rum gives semisweet flavor that I really liked. I gave her a “push” in the pressure cooker but ideally it has simmered a couple of hours … or the time you need. A delight. As I leave the support to you. French fries or mashed … rice or small pasta. A full plate I’m sure you will like us as we liked. 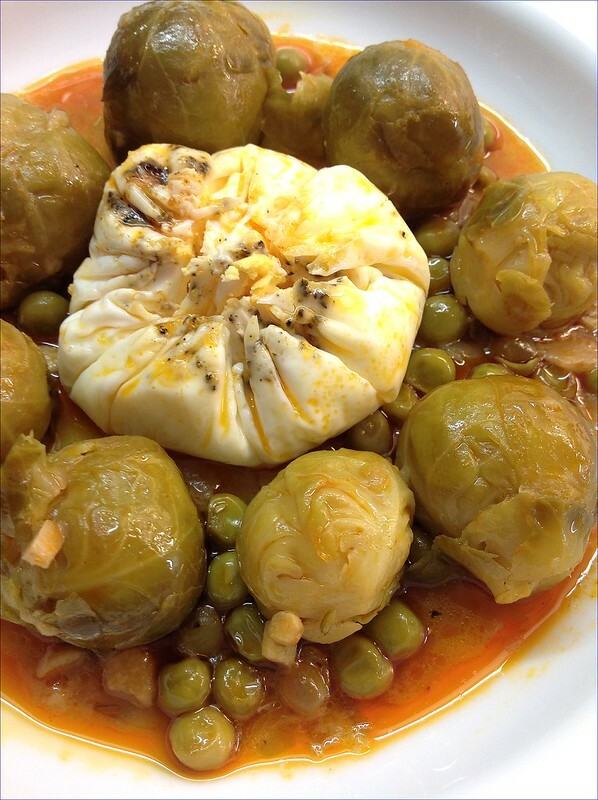 Telillas cleaned of the cheek, cut into large chunks and salpimentamos. Chop the onion, garlic and celery. The carrot and mushrooms cut them coarsely. In the pressure cooker with oil generous fund started sautéing the onion, garlic and celery over medium heat. When they start to brown add the meat and up the temperature to be sealed quickly. We add the carrot and mushrooms. We continue with spices, wine and rum. We let the alcohol evaporate a couple of minutes and add broth to cover. Close the pot and cook 15 minutes. Over time, uncover and continue simmering until the meat is completely tender and the sauce linked. These meatballs are so juicy to fatten my long list of ways to prepare the ground beef and that we like them all. I think they deserve a label just for them. With fries or mashed potatoes. 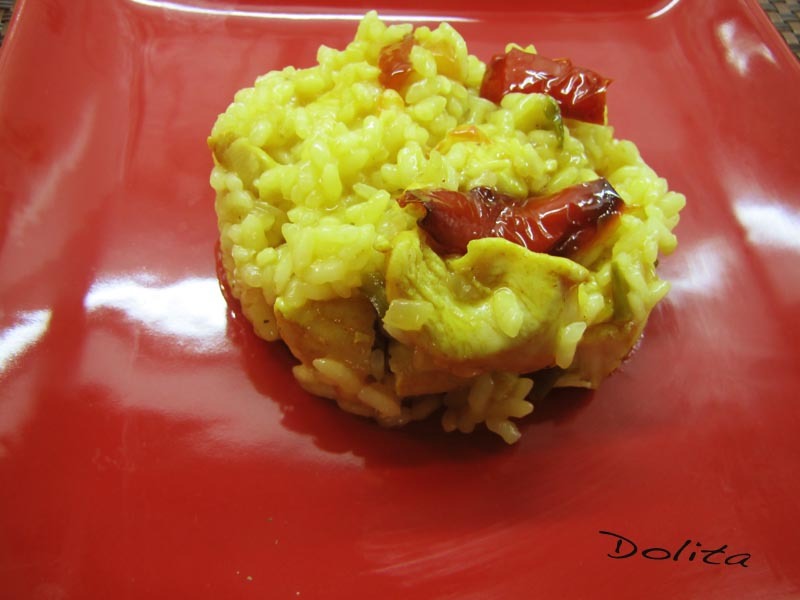 With some pasta rice or small format, cous-cous for example, are delicious. I served with some of the fried almonds and crispy slices of ham. 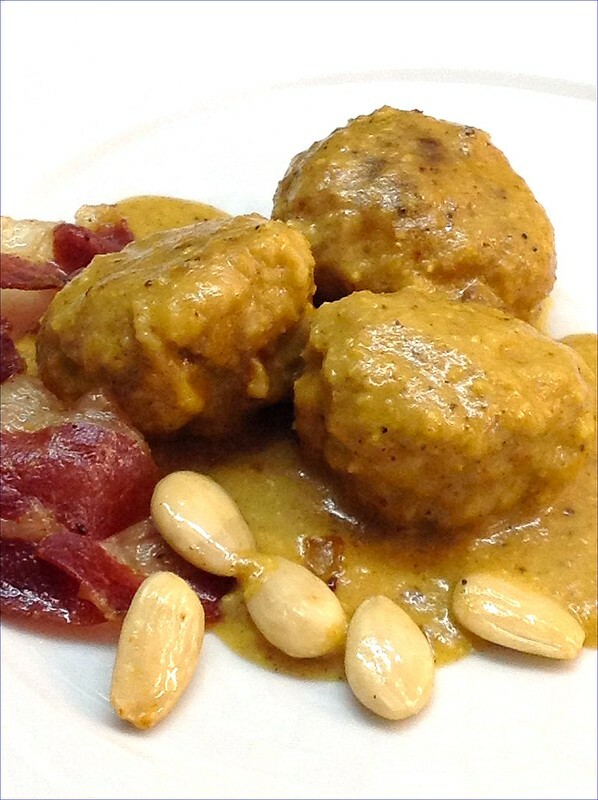 Prepare meatballs by mixing the meat in a bowl adding the ham, onion and a clove of finely chopped garlic. Incorporate peeled and grated apple, 1 egg, cream cheese and season. Mix well and, if necessary, put a bit of bread soaked in milk will have wrung well. Let stand at least one hour. We form the meatballs and let the floured frying in batches until golden. Reserved. Prepare the sauce browning in a pan with olive oil 3 slices of bread and almonds, the rest of the garlic and the rest of the chopped onion. Sauté well and add the wine and turmeric. We waited a couple of minutes and pour the broth. Cook until it forms a sauce linked to later crush them in a blender. Incorporate the meatballs to the sauce, cover and cook over medium heat about 10 minutes. In autumn season begins vegetables that I like. Despite all the frozen, if of good quality, I can have them when you want. This stew is simple, fast and tasty. Almost every time I can thick sauces with fried bread mashed in a mortar, I love the taste that gives … or will for my Andalusian roots, perhaps. A little cornstarch diluted serve us well. I can poach egg directly over vegetables or make a “package” in a cup that we will lined with oiled plastic wrap and seasoned. We closed well and boil in a pot about 6 minutes, as we like the point of the yolk. Heat up a base in a pan of olive oil over medium heat and sauté the onion and garlic finely chopped. In the same pan add the sofrito and waited bread browned. We take it out and put it in the mortar. We add the cabbage and peas, stir well and add the paprika. We dip with bread wine and majamos mortar into a paste and keep stirring the cumin and turmeric. We incorporate the stew quickly so as not to burn the paprika. Season and irrigate the vegetable stock or water and stock cube. Cook over medium-low about 15 or 20 minutes.